Every April 22 since 1970, more than 193 countries celebrate Earth Day with various measures to support environmental protection. Here in Mountain Village, every day is Earth Day as our staff and volunteers on the Green Team Committee work tirelessly to implement green, environmentally friendly measures throughout the community and we encourage homeowners to reduce their environmental footprint through a number of incentives. Several organizations are celebrating Earth Day in the region today, so there are opportunities aplenty to celebrate Mother Earth. 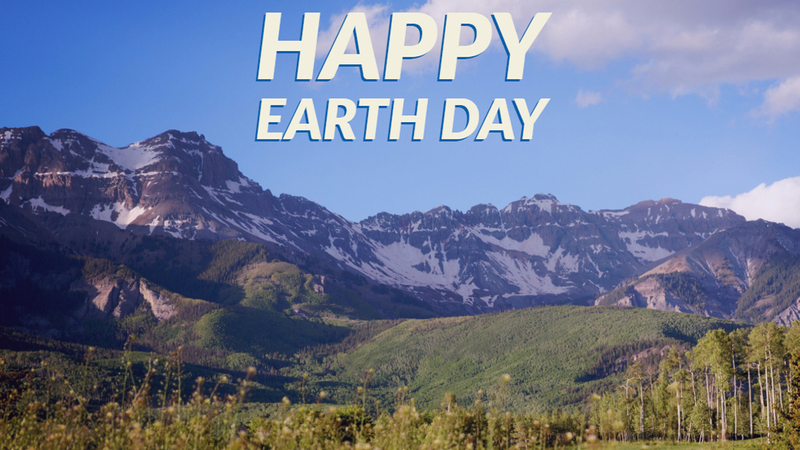 Telluride Earth Guardians, Pinhead Institute, Ah Haa, Carbon Neutral Coalition, EcoAction Partners, Sheep Mountain Alliance, and friends will gather on Elks Park from 3:30-5 p.m. to celebrate Earth Day on Monday. For more information on the gathering, please visit their Facebook event. The Wilkinson Public Library is encouraging middle and high school students to help clean up trash in Telluride from 3:30-5:30 p.m. Kids can check in at 3:30 p.m. to pick up equipment and head out to pick up trash. At 5:30 p.m. report back to the library for pizza and awards for Best of Trash! For more info, visit the library’s website. 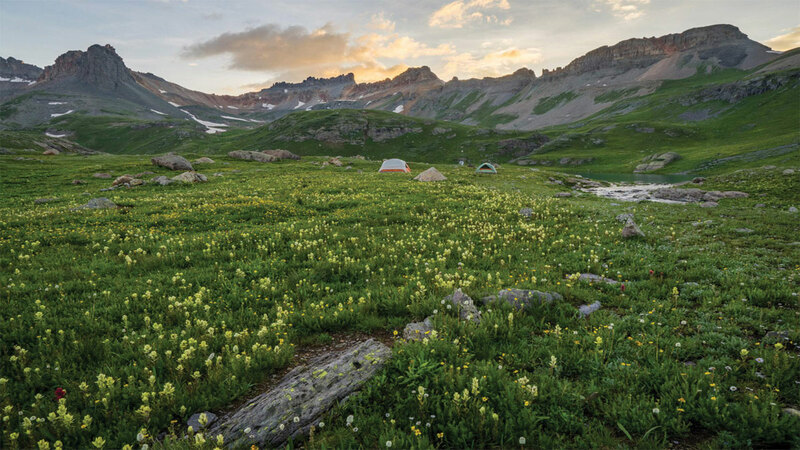 Additionally, the Telluride Mountain School will host a free, community-wide slide show presentation and book signing with nationally renowned, Colorado Landscape Photographer John Fielder on Monday evening. John is an avid outdoor enthusiast, conservationist and a wonderfully talented landscape photographer. For the past 38 years, he has dedicated his time and passion to capture the serene and breathtaking moments of Colorado’s most majestic landscapes. John will be on hand before and after the show to sell and sign all of his popular Colorado coffee table books, guide books, and children’s books, including his new book Colorado Black on White. 30% of sales to benefit the Outdoor Education Program at Telluride Mountain School. Every month, a committee of volunteers and Mountain Village staff convenes as the Gream Team to advise Mountain Village Town Council on environmentally friendly measures. In March, the Green Team started a monthly Green Tip of the month. These tips are ideas for residents to improve their impact on the environment in their home. 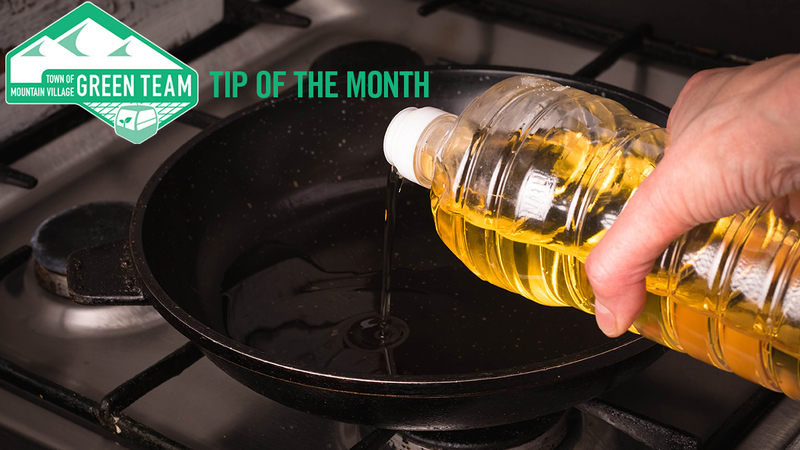 March’s green tip focuses on tips for more water efficient techniques for dishwashing, and April’s tip takes a look at cooking with excess fats, oils and grease. To learn more about the Green Team and its work, please visit our website. The Town of Mountain Village also recently announced its Smart Building Incentive Program offering significant building permit fees if owners take measures to increase renewable energy use, reduce exterior energy use on homes and more. Visit our Smart Building web page for more information. Each month, the Green Team Committee, a team of seven volunteers – including council members, residents, Telluride Ski & Golf and TMVOA staff – along with Town of Mountain Village staff meet to discuss strategies for living green in Mountain Village. The Green Team Committee encourages the community to appreciate and preserve the natural world and to facilitate conservation efforts, share knowledge and resources and advises the Mountain Village Town Council on matters related to environmental quality. Introducing the Green Team’s new Green Living Tips. Each month, the Green Team will share ideas and tips with residents for ways to improve their impact on the environment. 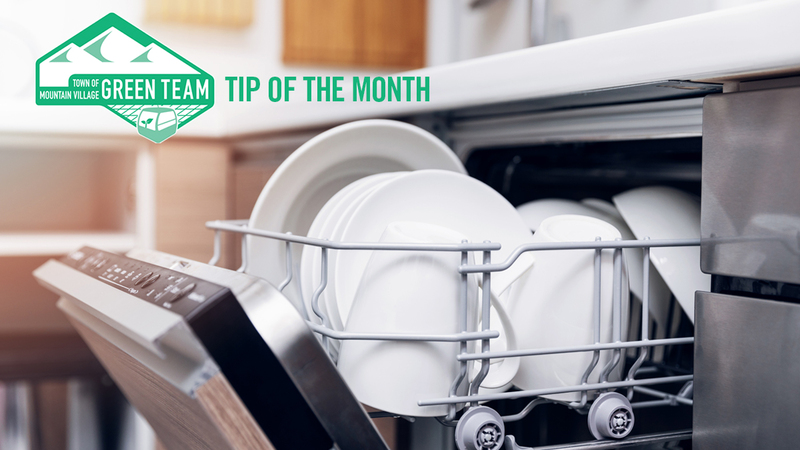 Don’t rinse dishes before loading, and you’ll save 55,000 gallons of water over the life of the appliance. That’s equal to a lifetime supply of drinking water for a family of four. If you have a newer dishwasher, it has a sensor that checks how dirty the water is to determine how much water and how long a cycle is needed to get the dishes clean. Then think about the 1.7 to 6 gallons of water you use every minute you run your kitchen faucet at full blast trying to knock off that food waste. You’re also paying for the energy used to heat the water. So even if you don’t have a newer dishwasher, rinsing with cold water will still save you money and energy. Stay tuned for monthly tips from our Green Team for ways to improve your environmental impact. Sources: Lowe’s & Consumer Reports. 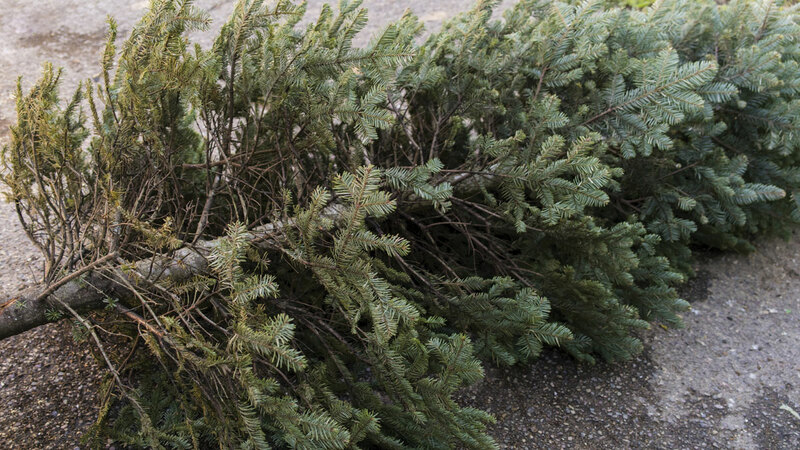 The San Miguel County holiday tree disposal site is moving this year to Ilium Valley—Vance Drive Industrial Area. Follow the marked signs. Please remove all lights and decorations from your trees. This site is for tree disposal only, please no other dumping of debris. Trees will be chipped on January 31. For more information, call (970) 728-3844. The Town of Mountain Village’s Farm to Community Incentive Program surpassed expectations in its inaugural year by delivering over 4,500 pounds of locally grown food and produce to community participants. Developed by Michelle Haynes, planning and development services director as a “climate action plan implementation measure,” the Mountain Village Green Team Committee unanimously supported the program along with the Town Council. 38 income qualified Mountain Village residents took part in a 14-week local farm share food program with an outcome exceeding the program’s goal of providing nine weeks of low-cost, high nutrient foods all while lowering carbon emissions by delivering a regionally grown food. Furthermore, the program gave a unique opportunity for Mountain Village residents to interact with local farmers, encouraging the use of new foods and recipes, and minimizing the time and distance for food shopping. The Town has approved an expanded program for 2019 with participating farms Mountain Roots Produce based in Mancos, Colorado and the F.R.E.S.H Food Hub, a community-run food co-op based in Norwood, Colorado. F.R.E.S.H Food Hub purchases food from local farms and producers such as Indian Ridge Farm and Bakery, Buckhorn Gardens, Birdhouse Farm, Laid Back Ranch, South River Aquaponics, and many more small-scale producers on the western slope. 2019 program applications are available February 1 for Mountain Village residents living in deed-restricted housing or meet the annual household income qualifications. 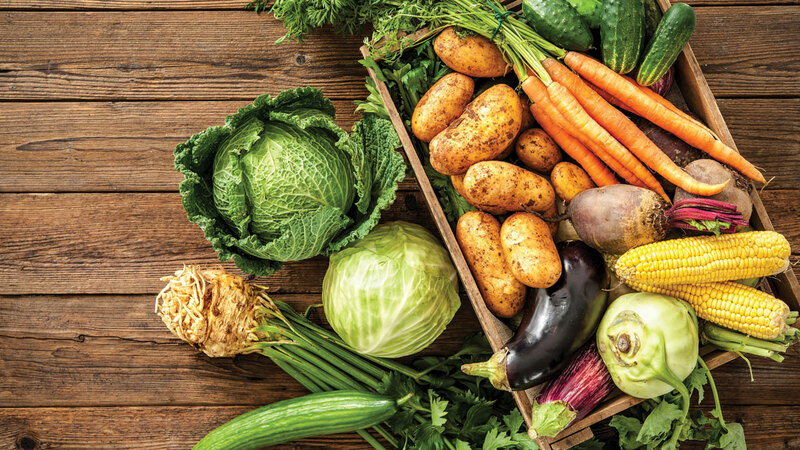 Furthermore, the town hopes to reduce their carbon footprint further and support the regional economy by developing a residential Community-supported agriculture (CSA) pick-up and a Town-led employee CSA wellness program. For program information, please contact Zoe Dohnal by email by phone (970) 728-8236 or by visiting townofmountainvillage.com/farm-to-community. 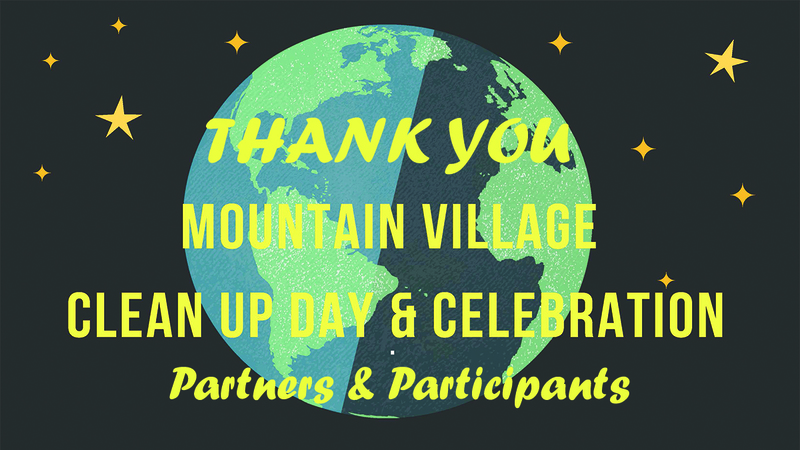 The Mountain Village Community Cleanup Day and Celebration was a great success!! We had 100 participants and four truckloads of trash! Thank you for all who came out to celebrate the beauty of where we live and taking steps to keep it that way. Mountain Village Community Clean-Up Day and Celebration Saturday, August 25 from 12 to 4 p.m.
Join Town of Mountain Village’s Green Team in cleaning up our trails and ski-runs in Mountain Village, Saturday, August 25 from 12 to 2 p.m. Clean up will be followed by a community-wide party in the Meadows Park, located adjacent from the Meadows parking lot on Adams Ranch Road. Music will be provided by the infamous DJ Sunday from 2 to 4 p.m. Volunteers are asked to arrive by 11:30 a.m. for registration and groups will be assigned an area of clean-up by a Green Team member at Meadows’s Park. Trash bags are provided, and participants are encouraged to bring gloves, wear long pants, comfortable shoes, and park at the Meadows parking lot (carpooling is encouraged!) Fabulous prizes will be awarded for various trash discoveries. Thanks to thoughtful donations from Telluride Ski Resort, Telluride Sports, the Telluride Trappings & Toggery, Poachers Pub, Tracks Cafe & Bar, Starbucks, Town of Mountain Village Owner’s Association (TMVOA), and others, prizes include a GoPro Hero4, Osprey Exos backpack, Grand Trunk Parachute Hammock, August Ink Sweatshirt and more! Lunch will be provided for those who attend, and we ask participants to bring reusable plates and cups. The inaugural event is intended to spread awareness of picking up trash when found, celebrating the beauty of where we live, and taking steps to keep our mountains clean and trash free! All are welcome to join and take part in the Community Clean-Up Event. 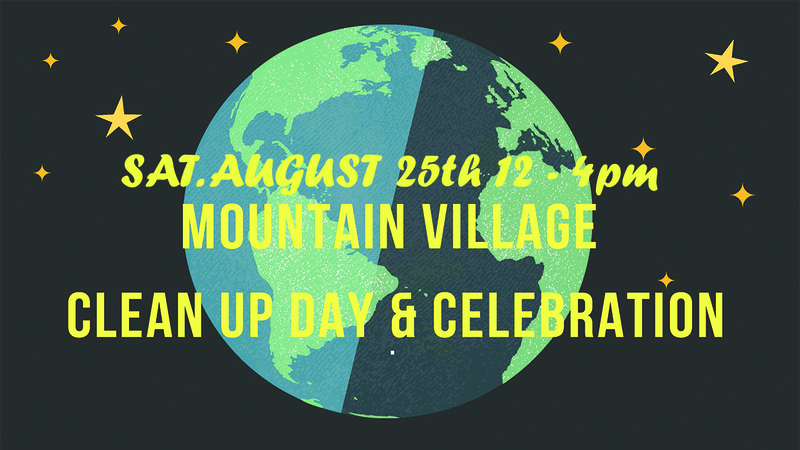 For more information on the event, please visit Town of Mountain Village’s Green Team. Beginning May 1, 2018, Town of Mountain Village will implement a Summer Water Conservation Resident Program in anticipation of a dry season restricting outside irrigation. Conservation program efforts will be in effect for the Town of Mountain Village, Ski Ranches, Elk Run and Skyfield. Based on recent reports from the United States Department of Agriculture Natural Resources Conservation Service and National Water and Climate Center (USDA/NRCS), Snow and Precipitation Update Report (Snotel), and Bikis Water Consultants Division of SGM, the Town is being proactive in initiating this year’s restrictions in May in an attempt to conserve water from the start of irrigation season rather than waiting until June when we could potentially be in a more sensitive drought situation. All properties north of Mountain Village Boulevard and Elk Run may water their landscaping on Mondays, Wednesdays, and Fridays ONLY. Irrigation clocks must be set to run at a level of 70-75% of regular water consumption for the three days a week you are allowed to water. Irrigating hours will be either before 10 a.m. or after 5 p.m.
All properties south of Mountain Village Boulevard, plus the Ski Ranches and Skyfield, may water their landscaping on Tuesdays, Thursdays, and Saturdays ONLY. Irrigation clocks must be set to run at a level of 70-75% of regular water consumption for the three days a week you are allowed to water. Irrigating hours will be either before 10 a.m. or after 5 p.m.
All exterior water features must be turned off during this conservation effort. Due to potential water contamination “cross-connection” occurrences, NO trucked in water will be allowed to be hooked up to existing irrigation systems. All properties north of Mountain Village Blvd and Elk Run residents may water their landscaping on Mondays, Wednesdays, and Fridays ONLY. Irrigation clocks must be set to run at a level of 70-75% of regular water consumption for the three days a week you are allowed to water. Irrigating hours will be either before 8 a.m. or after 7 p.m.
All properties south of Mountain Village Blvd, plus the Ski Ranches and Skyfield, may water their landscaping on Tuesdays, Thursdays, and Saturdays ONLY. Irrigation clocks must be set to run at a level of 70-75% of regular water consumption for the three days a week you are allowed to water. Irrigating hours will be either before 8 a.m. or after 7 p.m. Effective May 1, 2018, because of the need for new landscaping to receive additional watering to become established, landscaping installed before spring of 2017 and future landscaping projects may apply for additional irrigation permissions by permit. All permit applications which include landscaping additions or changes shall be reviewed on a case by case basis by contacting Mountain Village Senior Planner Dave Bangert by email or (970) 369-8203. Please be aware that if the San Miguel River goes under administration (on call), further water restrictions may be necessary as the Town follows its augmentation requirements. 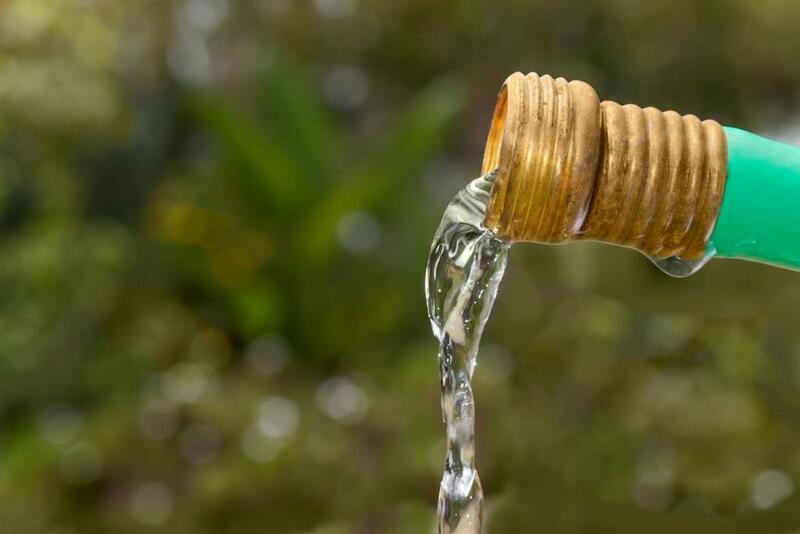 If the weather conditions do not cooperate, this could result in a ban on all outside watering from the Town’s water system. On the other hand, if the region does see a significant increase in moisture the Town may retract its water conservation efforts. For questions regarding the Town of Mountain Village Water Conservation Program, please contact Public Works Director, Finn Kjome at (970) 369-8206. Article from The Durango Herald: U.S. Sen. Michael Bennet introduced a bill Thursday that would designate nearly 61,000 acres of the San Juan Mountains as wilderness, extending the strictest federal conservation protections to some of the range’s most prominent peaks. “Not only are these iconic landscapes vital to outdoor recreation and local economies, but they also stand as a symbol of our public lands legacy in Colorado – a legacy we must pass onto our kids and grand-kids,” Bennet, a Democrat, said in a news release. The San Juan Wilderness Act expands or designates 11 areas within and surrounding the San Juan National Forest as wilderness or special management areas. Also included is a 6,500-acre mineral withdrawal at Naturita Canyon, a designation that would prevent future mining in the area. Protections under Bennet’s bill designate some of the most prominent peaks in the area as wilderness areas, including two Fourteeners – Mount Sneffels and Wilson Peak. “The Colorado River District has raised concerns with the private property and water rights within at least one of the proposed expansions. Additionally, the Colorado Snowmobile Association has significant concerns,” Mix said in an email. The expansion of the wilderness areas worries some outdoor recreational groups, such as the Colorado Snowmobile Association. Expansion of the wilderness would close many trails they ride on as well as access points to cross to other trails. Bennet worked closely with the San Miguel, San Juan and Ouray county commissioners in formulating the legislation, the release said. Bennet has been pushing this legislation since he came to the Senate in 2009 and closely consulted local leadership. “San Juan County has strongly supported the San Juan Wilderness Act for over a decade after we worked in our community with all local stakeholders to help craft a bill that has widespread support and represents a balanced approach to protecting the public lands that help drive our recreation economy,” said San Juan County Commissioner Pete McKay. A version of the bill was introduced in 2013 by then-Colorado Sen. Mark Udall. The bill passed with bipartisan support out of the Senate Energy and Natural Resources Committee that year, but the Senate never brought it to the floor for a vote. A wilderness designation is the federal government highest level of protection for public lands. According to the Wilderness Society, about one-third of the public lands receive permanent protections as wilderness, parks, refuges or other designations. There are 109 million acres of designated wilderness area in the United States. Bennet’s legislation received support of various environmental groups, including the Wilderness Society. “The San Juan Wilderness Act works to strike a balance between conservation, recreation, and smarter energy development in the future,” said Jeff Widen, senior regional conservation representative at the Wilderness Society, in a statement. Telluride Ski Resort, a premier destination in the San Juan National Forest, also cheered the introduction of the legislation. If passed through both chambers of Congress and signed by the president, the San Juan wilderness designation will prohibit additional roads and commercial enterprises from developing the area, according the National Park Service. 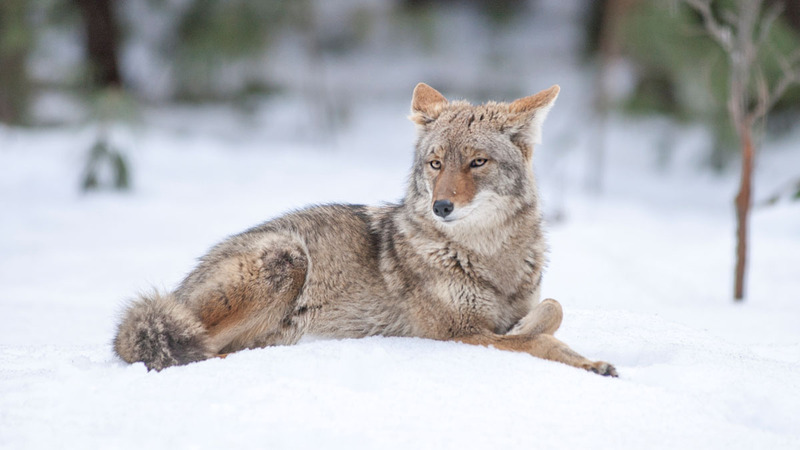 However, the Wilderness Act allows people to fight fires, control insect infestation and provide for human safety, but respects private property rights. Staff members for Republican Sen. Cory Gardner didn’t immediately respond to inquiries about the legislation. Andrew Eversden is an intern for The Durango Herald and a student at American University in Washington, D.C.An earlier version of this story erred in saying a version of the San Juan Wilderness Act passed unanimously out of the Senate Energy and Natural Resource Committee in 2013. It passed with bipartisan support, but not unanimously. Thank you to the Durango Herald for the article with photograph of The Ice Lakes area in the San Juan Mountains to be included in nearly 61,000 acres of the San Juan Mountains that would gain special federal conservation protections under the 2018 San Juan Mountains Wilderness Act. Photo credit: Jason Hatfield.